My Sweet Buff Orpingtons enjoying a mid-winter snack of chickweed! I am so proud of my girls for weathering this brutal winter! First, they had to adapt to increasingly frigid temps, and then when it seemed impossibly cold here, I brought them indoors to my mud room, where for weeks they looked longingly out to their garden (glass door) but enjoyed the heated floor and heater in the room that kept them from freezing even when it dipped below zero as it did at least one night. (Of course, my electricity bill reflects this :() But the 10 x 10 room offered them little in the way of exercise. They did not complain. They took it in stride. 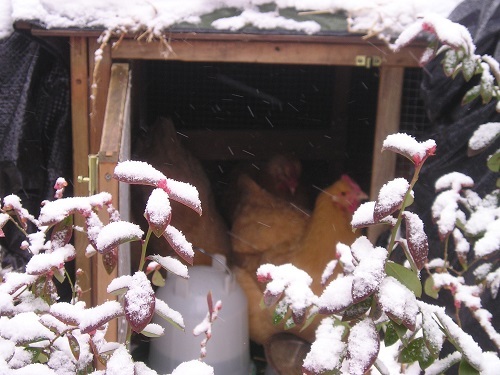 But, my goodness, were they ever happy to be released back to their spacious compound and coop, even though nights have dipped below freezing, with rain and even light snow, they are happy. And I am so proud of them. Now that the daylight hours are increasing, they are rewarding my love with beautiful large strong light brown eggs. Thank you girls! 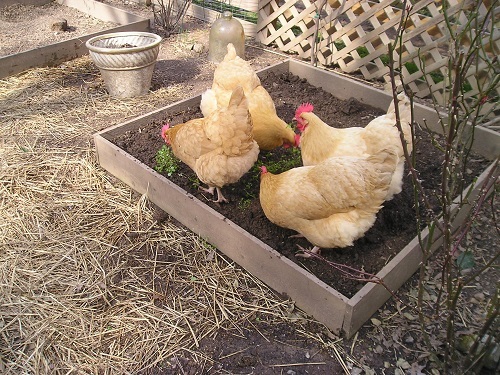 This entry was posted in Chicks and Chickens by Cherry Gal. Bookmark the permalink. What a sweet little story about survival in the worst winter to hit us in years. It helps to have a fairy godmother like Deb.